Chocolate, on chocolate, on chocolate. 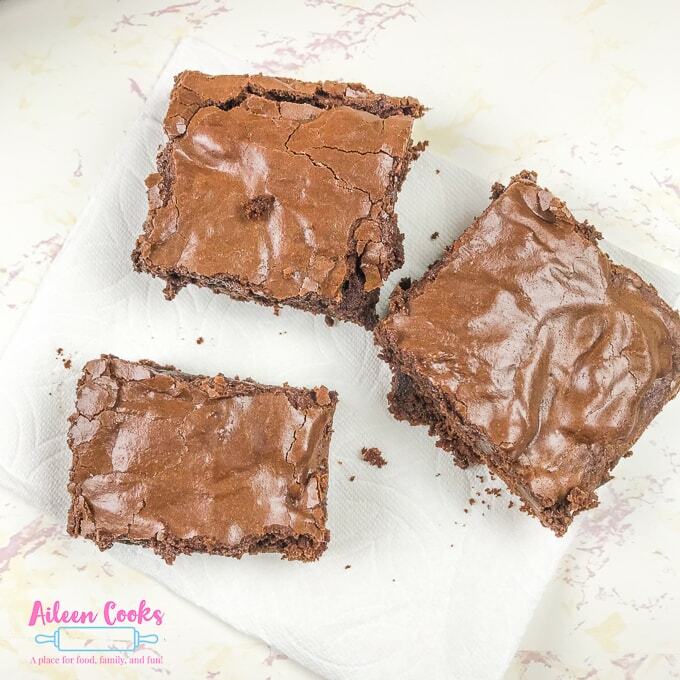 These chocolate chunk brownies are cakey and sweet with the creamiest chocolate frosting on top. I love a good brownie. I have made them in many different ways over the years from using cocoa powder to melted chocolate chips. I have made them with marshmallows on top and even experimented in making Nutella brownies. Today I am sharing a wonderfully cakey brownie recipe. They are airier than the chewy variety with the added texture of chocolate chunks mixed in. 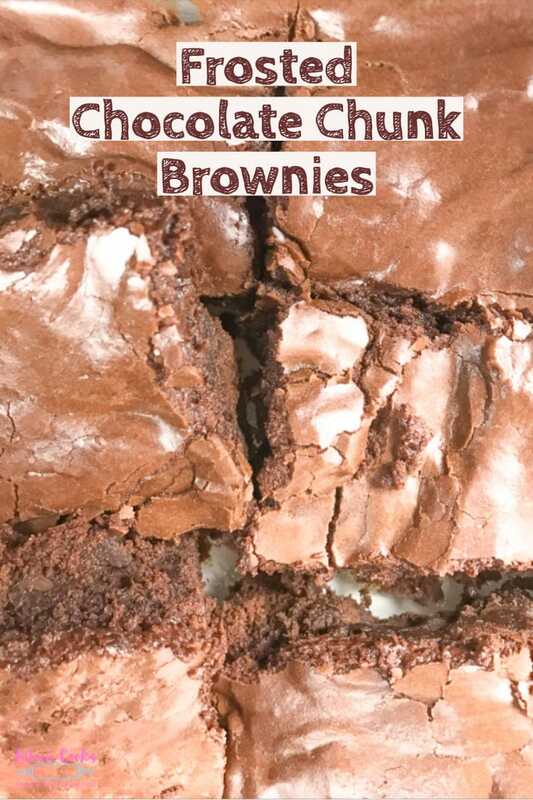 The perfectly sweet and fluffy chocolate frosting on top knocks this chocolate chunk brownie recipe out of the park. Here is my secret to making perfectly cakey brownies. I whip the batter. A lot. I used my KitchenAid stand mixer for this but you could easily use a hand mixer or your muscles. You start by whisking together the butter and sugar in this recipe and you want it to be really light and fluffy. If using a mixer, let it mix for about a minute. If using your hands, you will probably need to double that time. Then you slowly mix in the rest of the wet ingredients and mix until it’s light and fluffy again. You want all of that air mixed in with the batter. Continue to repeat this process until everything is incorporated. If you prefer the flavor of dark chocolate brownies than you can make that change in this recipe. The first time I tested this recipe I actually made them in a dark chocolate variety. They didn’t “look” quite the way I wanted them to so I switched back to regular chocolate chunk brownies. That’s not to say they didn’t taste great as dark chocolate brownies, they just didn’t photograph well. 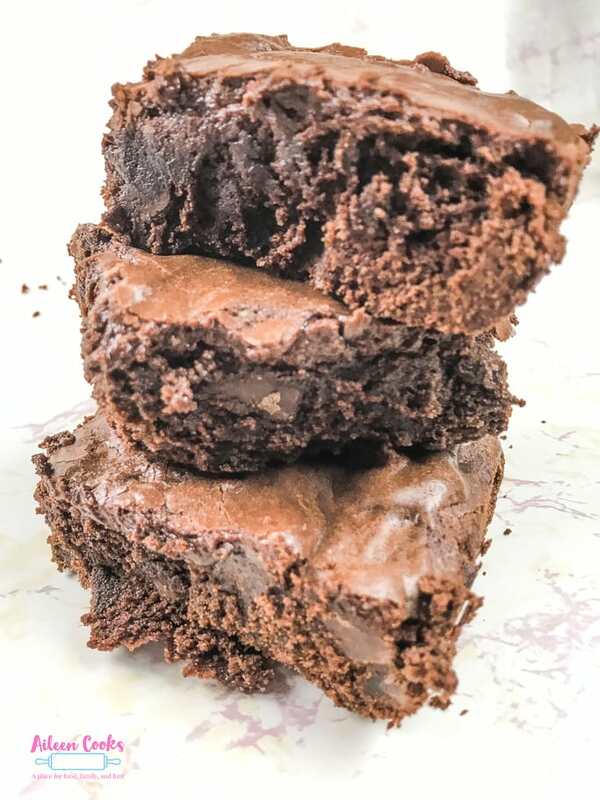 To make these chocolate chunk brownies into dark chocolate brownies, swap out the cocoa powder in the brownie batter and frosting to Hershey’s Special Dark Cocoa. Leave the chocolate chunks semi-sweet. 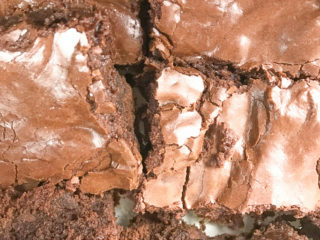 It adds a nice layer of flavor the brownies. This frosting is so creamy and delicious. It’s made with just a few ingredients: unsweetened cocoa, powdered sugar, milk, butter, and vanilla. It is really important that you take the time to sift the powdered sugar in this recipe. Otherwise, you will end up with lumpy frosting. Trust me, you do not want lumpy frosting. I know from experience that it takes away from the overall texture of the chocolate chunk brownies. Lightly tap on the side of the strainer until all or most of the powdered sugar has fallen through into the mixing bowl. 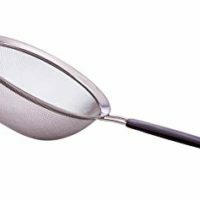 This prevents any pieces of powdered sugar that have stuck together into tiny hard rocks. I know, my terms aren’t scientific, but that is what happens. And it makes for a lumpy frosting. Trust me on this and sift your powdered sugar. It’s worth the extra 2 minutes. Having little helpers is not a requirement, but it makes it a lot more fun! 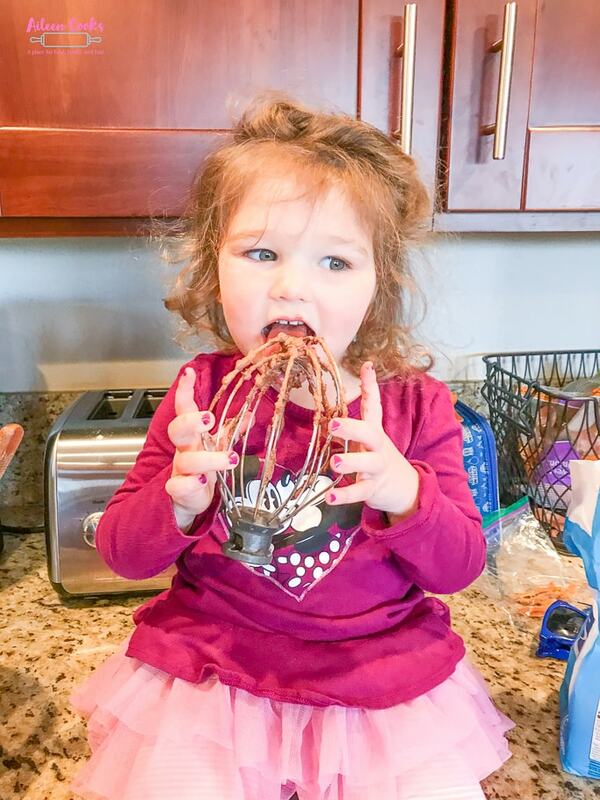 My littlest helped me make the frosting – and reaped the benefits. My middle helped me make the brownie batter and acted as my hand model. 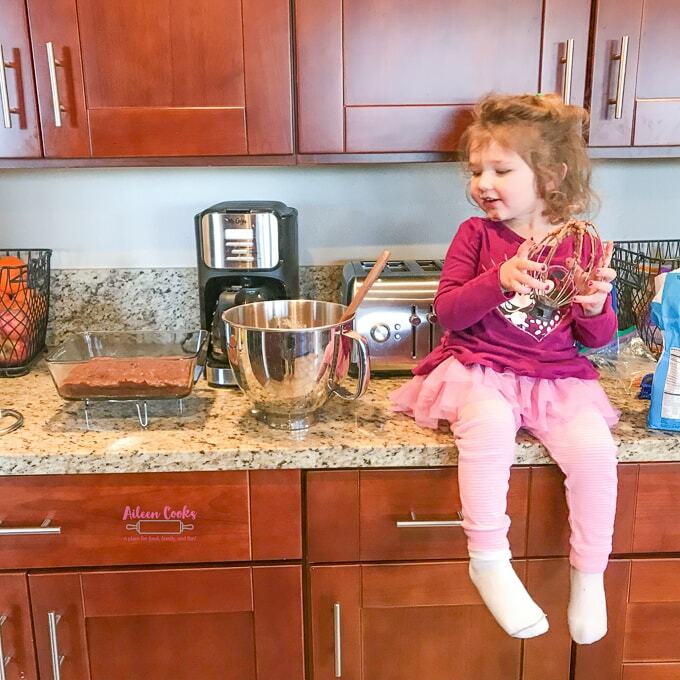 If you do have kids and want to start inviting them into the kitchen with you, then check out this post on cooking with kids. 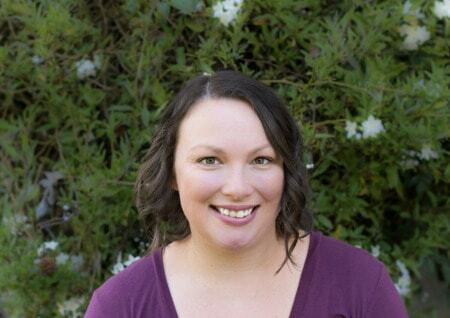 There are also several kid-specific recipes on my blog. Just search “cooking with kids” to find them. Preheat oven to 350 degrees. 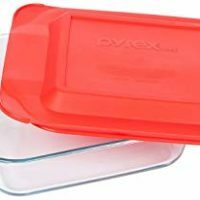 Grease a 8x8 baking dish and set aside. 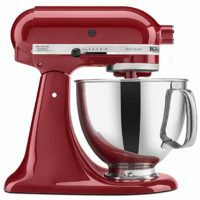 In the bowl of a stand mixer, whisk together 1/2 cup melted butter and granulated sugar. Mix until light and fluffy. Add in eggs, one at a time, allowing each to be fully incorporated. Pour in 1 teaspoon vanilla extract and continue mixing for 30 seconds. Combine flour, 1/3 cup cocoa powder, salt, and baking powder in a bowl and mix. Working in batches, slowly add dry ingredients to wet ingredients. Mix batter well after each addition. Pour batter into greased baking dish using a rubber spatula. Combine the powdered sugar, 1/4 cup softened butter, milk, 3 tablespoons cocoa powder, and 1 teaspoon vanilla to the bowl of a stand mixer. Beat, 2 minutes, until light and fluffy. Spread frosting on brownies while still hot. 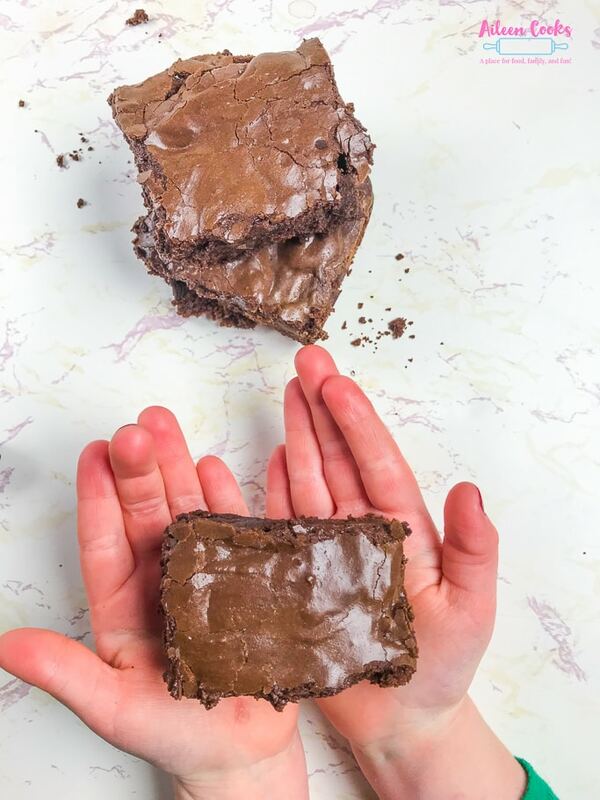 Let brownies fully cool before serving. Store any uneaten brownies in the refrigerator. 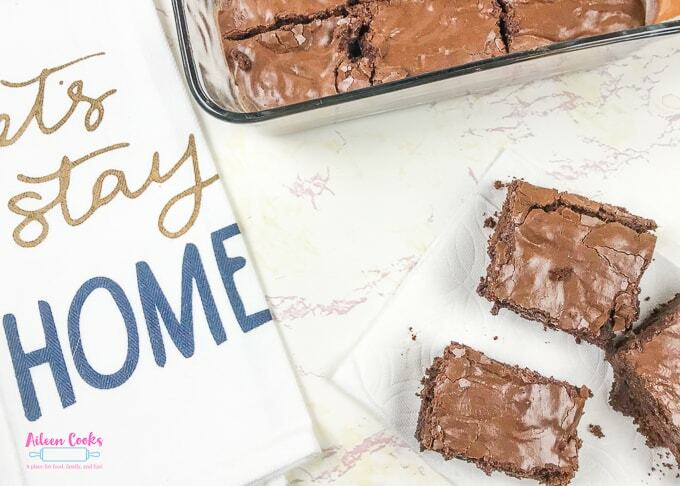 We love a good batch of brownies and these frosted chocolate chunk brownies are a new family favorite! Oh, wow! I really have to try this recipe. I know what I’m going to use the next time I make brownies!